Some, such as Michels with his ‘totaal voetball’ have done so with tactical innovation. Others, such as Sir Alex Ferguson or Arsene Wenger in English football, can claim to have dominated for a while. The likes of Jose Mourinho and Carlo Ancelotti have broken barriers with winning Champions League trophies with different clubs, building winning squads again and again. 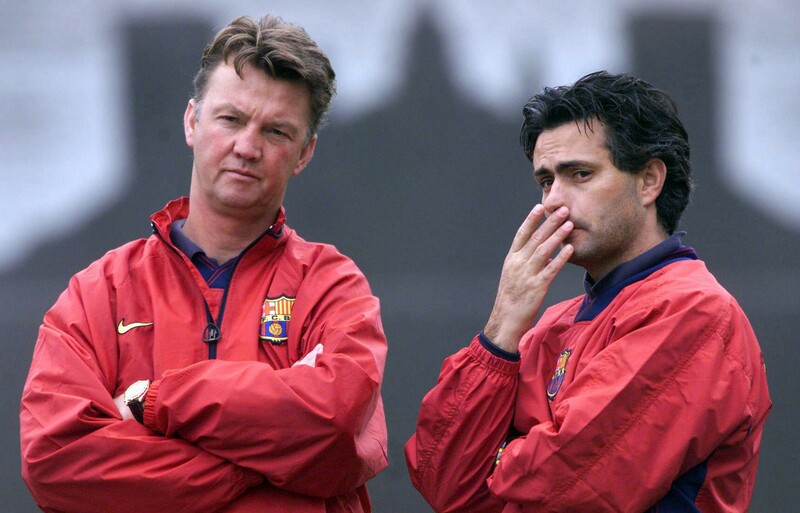 Very few however could lay claim to have influenced so many future high-profile managers, in such a short period of time, as Louis van Gaal did in his spell at Barcelona between 1997 and 2000. 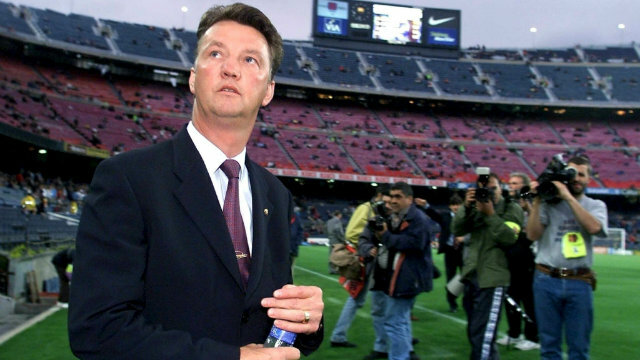 The Catalan club appointed Louis van Gaal as manager at the Camp Nou in 1997, following on from Sir Bobby Robson. The Englishman had won both the Copa del Rey and the Cup Winners’ Cup the previous season, only missing out on a clean sweep of trophies by a couple of points in La Liga, as perennial rivals Real Madrid took the crown. When van Gaal arrived however, the club retained Robson in what was described as an ambassadorial role, or what Robson himself said was akin to becoming “the world’s highest paid scout.” Nevertheless, Robson recommended, and van Gaal accepted the advice, to retain Jose Mourinho, who had followed Robson since his arrival in Portugal as a coach. In the Bluagrana playing ranks at the time was a pair of midfielders both destined to later manage the club, Pep Guardiola and Luis Enrique. It would be true to say therefore that at least part of their, and Morinho’s, football education was shaped by Robson, but in the following seasons, van Gaal took it on a further step as he secured the La Liga title for the Catalans in successive seasons. A year into his tenure, van Gaal then took a further midfielder under his tutelage as Philip Cocu joined the club, to be followed by Ronald Koeman as part of the coaching staff. The next year Frank de Boer added his skills to the squad. Between them, these half-dozen went on to manage clubs of the stature of Benfica, Porto, Chelsea, Inter Milan, Real Madrid, Barcelona, Bayern Munich, PSV Eindhoven, Ajax and a host of others, accumulating four Champions League trophies between them. The trophy with the big ears was one that van Gaal himself was only to lift once in his career – at least so far – but his burgeoning influence on his charges has reaped rich rewards in that particular sphere. 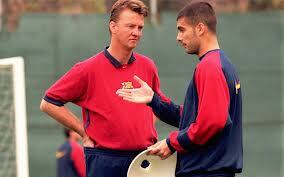 It is of course difficult to isolate what each of the future managers learnt from van Gaal. Guardiola for example has, talking of his former coach, remarked that, “I’m not sure he is the best coach in the world as he keeps saying, but certainly one of the best. I learned a lot with him. I would have to ask him, though would he do things the same way if he had to do it all over again?” The comment may have something to do with van Gaal’s last season at the Camp Nou when his style caused conflict with a number of players, not least the talismanic Brazilian Rivaldo, who was very much the team leader at the time. It was to lead to the end of his time at the club. A number of Guardiola’s former players have levelled similar accusations about him however. The autobiography of Zlaten Ibrahimovic certainly pulls no punches on that particular score. Looking at the three other managers mentioned above, it’s difficult to identify such a rich heritage for any of them that would compare to the time van Gaal had in Catalunya. Michels clearly influenced the development of Johan Cruyff who went on to win the European Cup, as it was then labelled, with Barcelona, and a couple of other members of his squad have also gone on to fairly decent managerial careers, but nothing that resembles van Gaal’s crop. Sir Alex Ferguson, for all his success and long tenure at the head of Manchester United’s trophy-hoarding juggernaut had only a few of his ex-charges operating as managers and the exploits of the likes of Steve Bruce and Bryan Robson, for example did little to really set the world alight. Although Laurent Blanc is enjoying success with PSG, and Mark Hues, Paul Ince and Ole Gunnar Solskjær have managed in the Premier League, there’s no outstanding record of trophy-laded success. A similar assessment can be made of Wenger. Tony Adams’ abortive spell at Portsmouth to one side, it’s difficult to isolate a successful manager from his ex-players, although Dennis Bergkamp may just be the first. It’s arguably too soon to look at the heritage that Mourinho or Ancelotti may leave, but with van Gaal still to retire, his three year spell at the Nou Camp stands as a beacon that may even yet be added to. 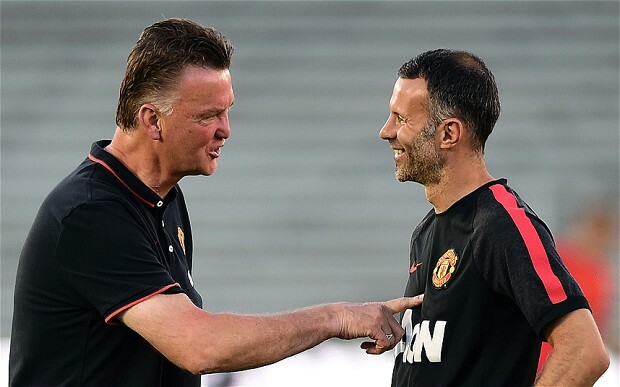 Over at Old Trafford, the seemingly long-term plan for the Dutch master to groom Ryan Giggs to take over in a couple of seasons or so, may just be looking an extremely astute decision. (This All Blue Daze article was originally produced for the ‘touchlinebanter’ website).